ICME-12: Beyond "Rise over Run"
Michael Matassa and I were honored to conduct a workshop and sharing group at the ICME-12 conference in Seoul, South Korea on July 11, 2012. 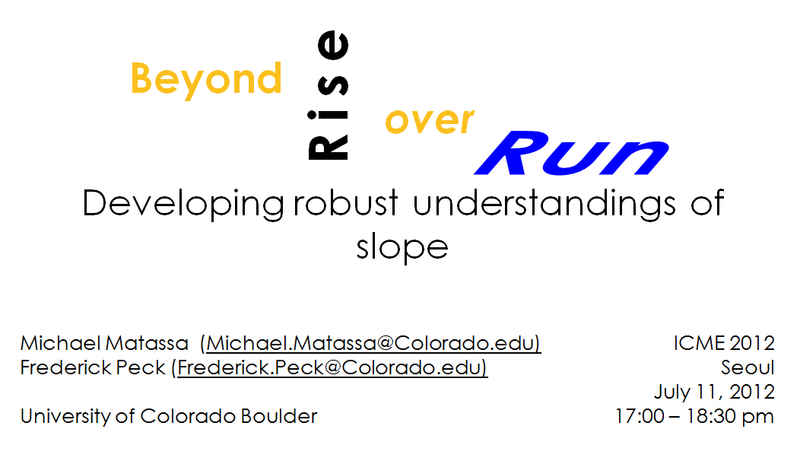 During the workshop, participants explored tasks that Michael and I created during a design experiment focused on helping students develop a robust understanding of slope and linear functions. We are happy to make our presentation, paper, and complete unit available for download. We welcome your feedback (via email or in comments), and we hope that you use and adapt the activities with your students! 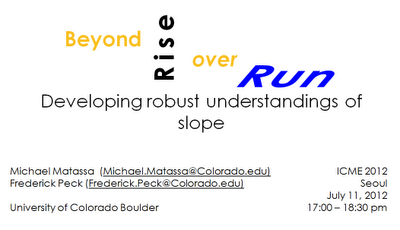 Student understanding of slope and rate of change is often formulaic and underdeveloped. This presents problems for students in secondary and post-secondary mathematics where slope and rate of change are key foundational concepts. To study how students develop robust understandings of slope and rate of change, we conducted a design experiment in a U.S. high school Algebra I classroom that focused on developing versatile and adaptable knowledge of slope using rate of change as a foundational concept for slope. In this workshop, participants will contribute to an international perspective on the teaching of slope, engage in key activities that were used in the design experiment, and explore student work generated from these activities.